The cave architecture in India is believed to have begun in the third century BC. These caves were used by Buddhist and Jain monks as places of worship and residence. 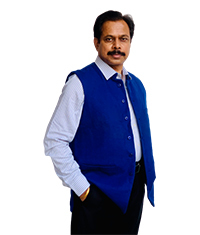 Initially the caves were excavated in the western India. Some examples of this type of cave structure are Chaityas and Viharas of Buddhists. The great cave at Karle is one such example, where great Chaityas and Viharas were excavated by hewing out rocks. The Karle caves are big in size and the interior is lighted up by great windows. Besides the caves at Karle, many caves were excavated at other places. These were excavated not only by Buddhists or Jains but also by Hindus. Some of the famous and prominent caves are at Nashik, Kanheri, Gaya (Barabar Hills), Bhaja, Nagarjunikonda, Badami, Elephanta and Ellora. These caves house some of the amazing murals, sculptures and architectural structures. The Elephanta caves contain Maheshmurti, Shiva in three aspects of Creator, Preserver and Destroyer. This is undoubtedly one of the finest single piece Indian sculptures. There are numerous such great examples of Buddhist, Hindu and Jain rock temples at Ellora but the most spectacular of all splendid is the Kailasha temple. The Kailasha temple was hewn of rocks. 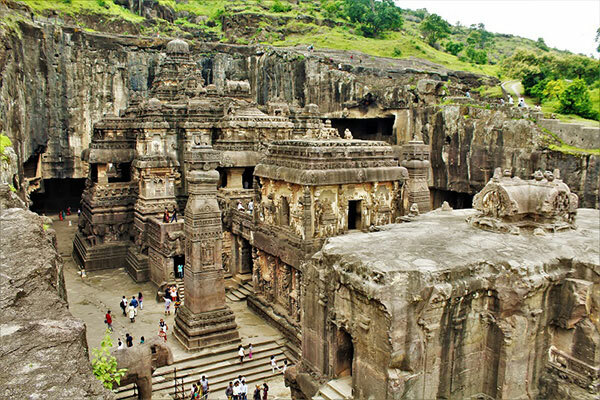 Maharashtra is home to the spectacular and amazing Ajanta and Ellora group of caves. The cave at Ajanta and Ellora were cut out of rock, by hand, and rank amongst some of the most outstanding specimens of ancient Indian architectural heritage. In all there are 34 caves at Ellora and 29 caves at Ajanta. Caves Ajanta caves were rediscovered in the 19th century by British officers. The Ajanta caves depict the story of Buddhism, spanning the period from 200 BC to 650 AD. The caves at Ajanta served as secluded retreats to the Buddhist monks. Beautiful wall frescos and sculptures speak volumes of the advancement of Indian art in ancient period. Some of the caves at Ajanta house panels depicting stories from the Jatakas, stories about several incarnations of the Buddha. Cave number one contains wall fresco that include two great Bodhisattvas, Padmapani and Avalokiteshvara. Other wonderful paintings in Ajanta are the flying apsara, dying princess and Buddha in preaching mode. At Ellora, the caves are 34 in number. The Ellora caves are carved into the sides of a basaltic hill. The caves at Ellora contain some of the finest specimens of cave-temple architecture and exquisitely adorned interiors. Structures in the Ellora caves represent the three faiths of Hinduism, Buddhism and Jainism and were carved during 350 AD to 700 AD. The nobility, serenity and grace of Buddha are visible in the Buddhist caves of Ellora. 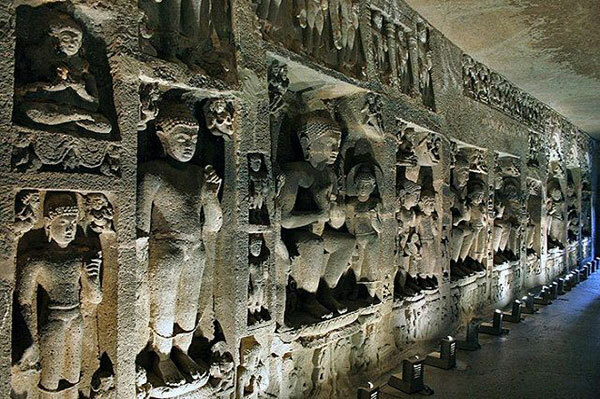 Ellora caves also contain images of Vishwakarma, the patron saint of Indian craftsmen. The Kailasha temple in Cave 16 is indeed an architectural wonder, the entire structure having been carved out of a monolith.